Prescription Drug Abuse becoming Widespread throughout the US. Prescription drug abuse remains a significant problem in the United States. 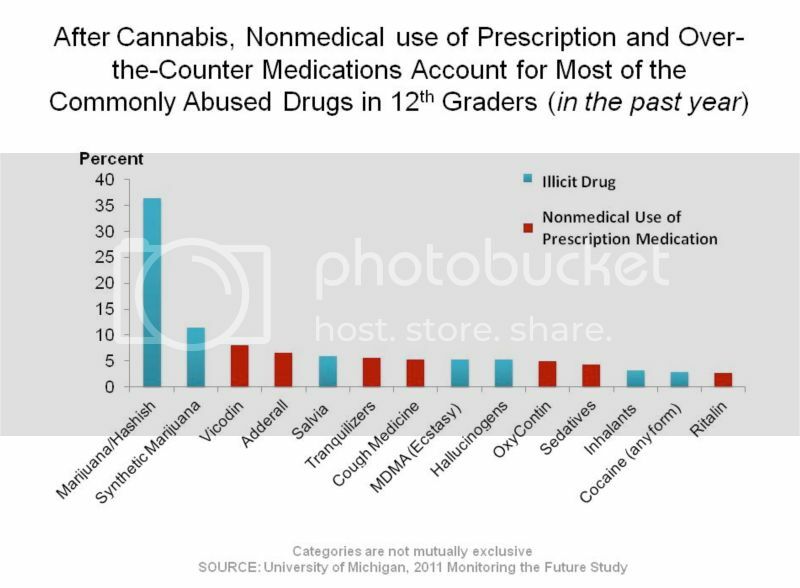 Among adolescents, prescription and over-the-counter medications account for most of the commonly abused illicit drugs by high school seniors (see chart). Nearly 1 in 12 high school seniors reported nonmedical use of Vicodin; 1 in 20 reported abuse of OxyContin. When asked how prescription narcotics were obtained for nonmedical use, 70% of 12th graders said they were given to them by a friend or relative (MTF 2011). The number obtaining them over the internet was negligible. Among those who abuse prescription drugs, high rates of other risky behaviors, including abuse of other drugs and alcohol, have also been reported. What is driving this high prevalence? Misperceptions about their safety. Because these medications are prescribed by doctors, many assume that they are safe to take under any circumstances. This is not the case. Prescription drugs act directly or indirectly on the same brain systems affected by illicit drugs. Using a medication other than as prescribed can potentially lead to a variety of adverse health effects, including overdose and addiction. Increasing environmental availability. Between 1991 and 2010, prescriptions for stimulants increased from 5 million to nearly 45 million and for opioid analgesics from about 75.5 million to 209.5 million. Varied motivations for their abuse. Underlying reasons include: to get high; to counter anxiety, pain, or sleep problems; or to enhance cognition. Whatever the motivation, prescription drug abuse comes with serious risks. Addiction. Prescription opioids act on the same receptors as heroin and can be highly addictive. People who abuse them sometimes alter the route of administration (e.g., snorting or injecting) to intensify the effect; some even report moving from prescription opioids to heroin. NSDUH estimates about 1.9 million people in the U.S. meet abuse or dependence criteria for prescription opioids. Overdose. Abuse of opioids, alone or with alcohol or other drugs, can depress respiration and lead to death. 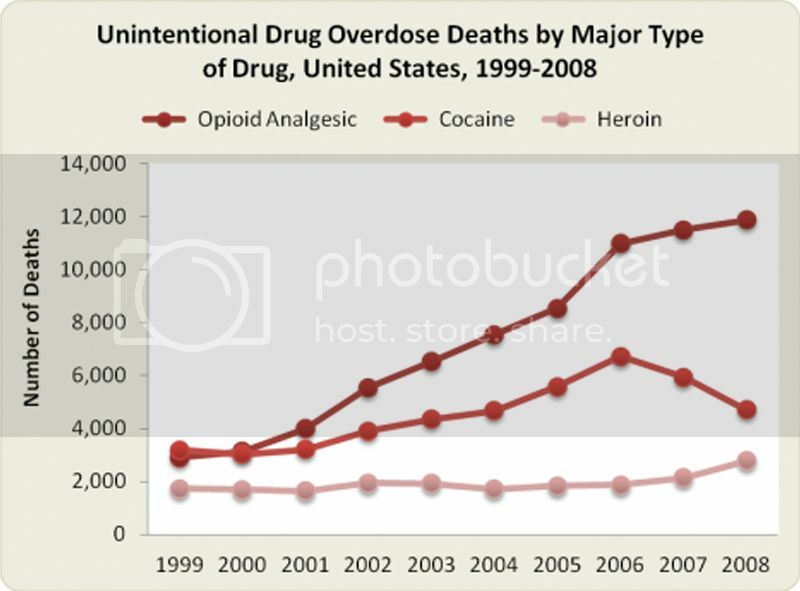 Unintentional overdose deaths involving prescription opioids have quadrupled since 1999 and now outnumber those from heroin and cocaine combined. Heightened HIV risk. Injecting opioids increases the risk of HIV and other infectious diseases through use of unsterile or shared equipment. Noninjection drug use can also increase these risks through drug-altered judgment and decisionmaking. Addiction and dangerous withdrawal symptoms. These drugs are addictive and, in chronic users or abusers, discontinuing them absent a physician’s guidance can bring about severe withdrawal symptoms, including seizures that can be life-threatening. Overdose. High doses can cause severe respiratory depression. This risk increases when CNS depressants are combined with other medications or alcohol. Addiction and other health consequences. These include psychosis, seizures, and cardiovascular complications. Available options for effectively treating addiction to prescription drugs depend on the medication being abused. Approaches to treating pain reliever addiction are drawn from research on treating heroin addiction, and include medications combined with behavioral counseling. A recent large-scale clinical trial supported by NIDA showed that Suboxone (buprenorphine + naloxone), prescribed in primary care settings, helped about half of participants reduce their pain reliever abuse during extended Suboxone treatment. Another promising approach includes longacting formulations of medications, such as Vivitrol, a depot formulation of the opioid receptor blocker naltrexone, recently approved by the FDA to treat opioid addiction. With effects that last for weeks instead of hours or days, long-acting formulations stand to aid in treatment retention and abstinence. Although no medications yet exist to treat addiction to CNS depressants or to prescription stimulants, behavioral therapies proven effective in treating other drug addictions may be used. NIDA is also supporting multiple studies to identify promising medications for stimulant addiction. NIDA’s multipronged strategy to reverse prescription drug abuse trends complements and expands our already robust portfolio of basic, preclinical, and clinical research and educational and outreach initiatives. NIDA-supported researchers are conducting large-scale epidemiological studies investigating the patterns and sources of nonmedical use of prescription medications in high school and college students. Results suggest that prevention efforts should include a focus on the motivations behind the abuse, which often have an age and gender bias. NIDA is also leading efforts to develop pain medications with diminished abuse potential, such as those that bypass the reward system of the brain. This is particularly important in light of returning veteran and growing elderly populations. To that end, NIDA is supporting research to better understand how to effectively treat people with chronic pain, which may predispose someone to become addicted to prescription pain relievers, and what can be done to prevent it among those at risk. Previous Previous post: Why are Healthy Adolescents turning to Stimulants like Adderall ?